These vegan pumpkin muffins can be made with gluten-free, whole wheat or all-purpose flour. 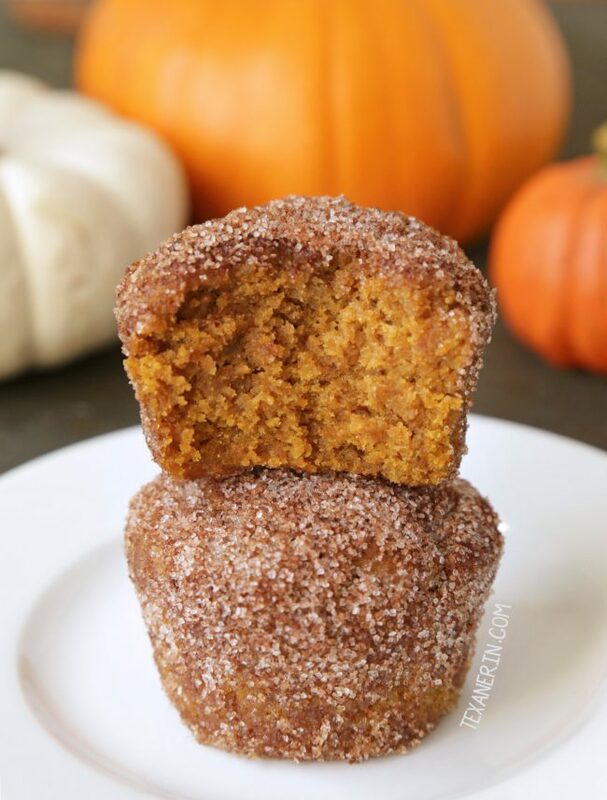 Naturally sweetened with maple syrup and covered in cinnamon sugar! If you want something that’s grain-free, check out my paleo pumpkin donuts and just make them with a regular-sized muffin pan! If you make the gluten-free version and they’re a little weird or gummy straight out of the oven, just let them sit a while (maybe 1-3 hours) and they’ll somehow magically straighten themselves out! Something I discovered when remaking them is that dipping them in butter or coconut oil is totally unnecessary to get the cinnamon sugar to stick. When you use butter, it’s like you actually have to dip them twice in the sugar because the first go around, the butter absorbs it all and it kind of disappears. So unless you want them buttery and full of sugar, then just forget about the butter! When these pumpkin muffins come out of the oven, they look kind of funky texturally but they’re perfectly moist and have an awesome texture. A lot of the reviewers have commented on their fluffiness, but for me… they’ve always come out a little dense! But dense in a good way. If you need convincing to make these, just read some of the reviews. Everyone seems to love them! 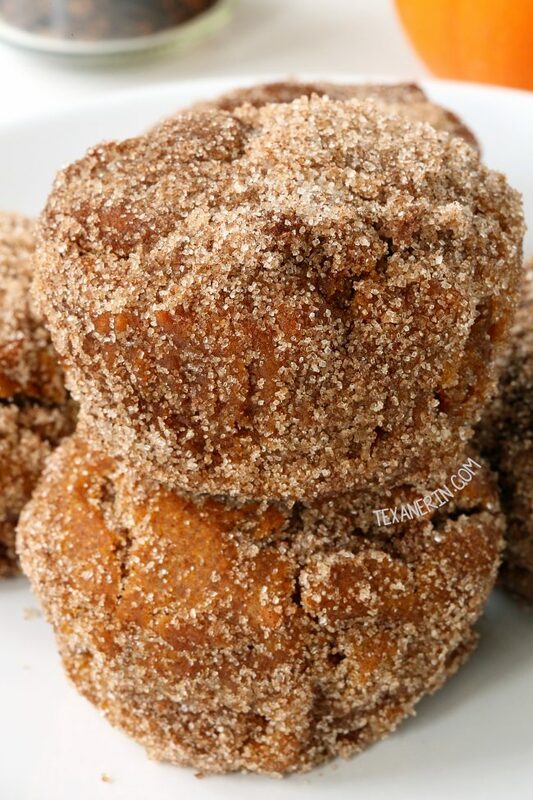 These pumpkin cream cheese muffins have also been a big hit (but they’re not vegan)! You know how you normally just plop the batter in the pan and if it’s not very even, neat or pretty, it straightens itself out while baking? That doesn’t happen here. How they look in the pan is pretty much how they look after baking. 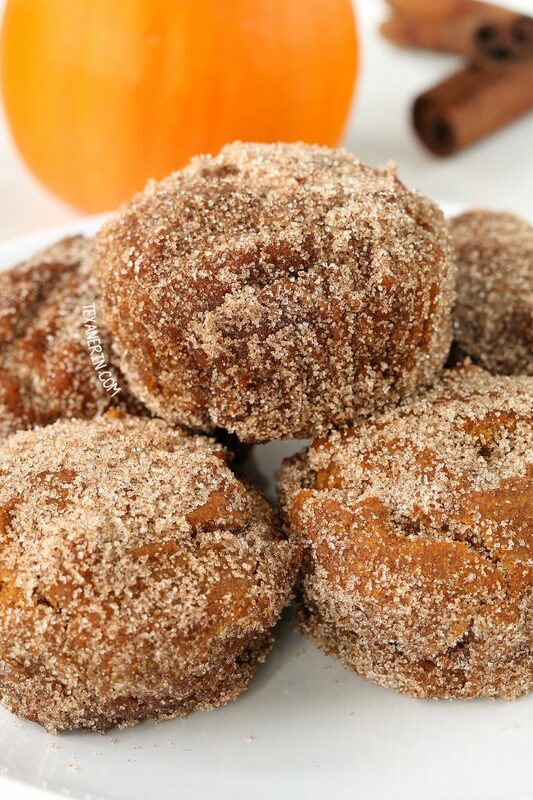 I adapted this vegan pumpkin muffins recipe from these maple pumpkin donuts on My Darling Vegan. If you don’t have a mini muffin pan or if you want some spiced glaze instead of cinnamon sugar, go check it out! Looking for more great gluten-free and vegan recipes for fall? I’ve got you covered! Try my Swedish apple pie, paleo and vegan pumpkin pie, or gluten-free apple crisp! 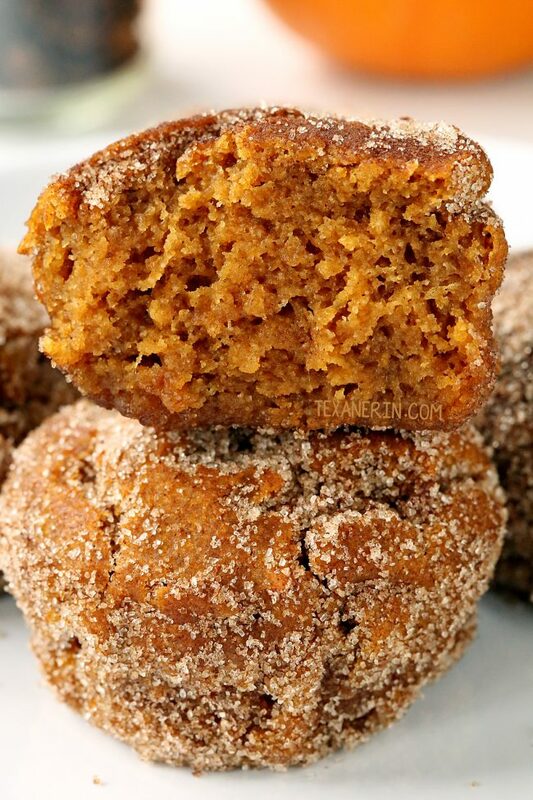 These No-bake Pumpkin Spice Donut Holes from Lauren Kelly Nutrition also sound super interesting! I’ll definitely have to try them out. Here’s the old picture for those of you who have made these before and are confused by the new pictures! Preheat the oven to 350°F (175°C) and line muffin pan with 6 muffin liners. In a medium bow, mix together the dry ingredients (flour through cloves). Set aside. In a large mixing bowl, stir together the oil, maple syrup and pumpkin. Add the dry mixture to the wet one and stir just until combined. Divide among the liners and bake for 25-30 minutes or until a toothpick inserted in the middle comes out clean. Invert the muffins onto a wire rack to partially cool, about 5 minutes, while you prepare the cinnamon sugar topping. Remove the muffin liners. Mix together the sugar and cinnamon in a small bowl. Dip the tops and sides of the mini muffins in the butter (if using) and then roll in the cinnamon sugar. If you make the gluten-free version and they're a little weird or gummy straight out of the oven, just let them sit a while (maybe 1-3 hours) and they'll somehow magically straighten themselves out! Can be stored in an airtight container in the refrigerator (if you used butter) or at room temperature (if you didn't use butter) for up to 3 days. If you use unrefined instead of refined coconut oil, these will taste coconut-y. 86 comments on “Vegan Pumpkin Muffins (gluten-free, whole grain options)” — Add one! These look delicious! To clarify, this recipe only makes 6 mini muffins. If I wanted to fill a full 24-cup pan, then I would need to quadruple the recipe? Thanks! It makes 6 regular-sized muffins, not mini muffins. :) So if you had a 24 mini muffin pan, it’s probably the right size for this recipe. Or it might only yield about 18. I haven’t tried so I’m not sure. Made a double batch, and used melted vegan Becel instead of coconut oil. They are incredibly fluffy, moist, and super delicious!! We devoured them! Thank you SO much for adding alternatives to coconut oil. My son is severely allergic to coconut and I’m always hesitant to sub something else in for it when baking, so I often end up not trying a recipe at all. These look amazing and I’m very excited to try them! These look wonderful! Do you think I could add some raisins and/or pecans? I’m going to make them with spelt flour for some guests and would like them to be as hearty and healthy as possible. Hi! I think both would a great addition. I hope you’ll all enjoy them! Hi! I hope they came out well. :) I don’t remember there being an issue with dividing it into liners or it being especially sticky. Did you make any changes to the recipe? Did your melted coconut oil harden while the batter was sitting? That can make batters thick! can you substitute unsweetened applesauce or something for the oil? I follow an oil free plan. I’ve got to say that you probably know more about oil subs than I do then. ;) It’s such a small amount I’m guessing it’d be an okay sub but since I haven’t tried, I can’t say for sure. I have to watch my blood sugar, but no diabetic. Do you happen to know how many grams og sugar and also saturated fat in each muffin? These look so good, would love these for breakfast or a afternooon snack. Thank you so much. Sorry for just now seeing your comment! I don’t have that information but you can copy and paste the recipe here for the nutritional analysis, if you’d like. :) Hope you’ll get to try the muffins out! Just made these for my son who is vegan and everyone else isn’t. Not sure who liked them more! Delicious and so moist. Made mini muffins, 15 to 18 min at 350°, and did not have to use butter to coat them. Wonderful! I’m so happy that you all enjoyed them and didn’t have issues with making them in mini form. :) Thanks for your comment! The recipe says the yield is 8 muffins, but it says to line the muffin tin with 6 liners. This recipe makes 8 muffins, correct? I actually made them bigger and changed it to 6 muffins. I just updated the yield to 6 (that’s what the given baking times are for). Thanks! I made these for my daughter with FPIES (a weird food allergy) for her Halloween party at school. It is a breakfast themed menu and wanted her to have something she could eat. They are in the oven, but oh my goodness the batter was define! I ended up making a second batch while the first ones were in the oven! Thank you for this fabulous recipe! I love that you made a second batch right away. :) I hope that your daughter and her classmates enjoyed the muffins! Thanks a bunch for your comment. Delicious! Doubled the batch, came out perfect. Husband loves them for breakfast. Will make again! Delicious! Doubled recipe and froze, just reheat in microwave on defrost. Husband loves them for breakfast. Had to search again for recipe since I forgot to save. I’m happy you found the recipe again! Thanks for your feedback. :) So happy that you like the muffins! Just made the pumpkins muffins for my Son and his family who are vegan. OH MY GOSH they are so good, I really love them!!!! Can I double this recipe? Could I translate this into a loaf recipe? Just cook longer maybe?? I am working with only a toaster oven until we replace my regular oven, so the muffin pan won’t fit. Hmm. Muffin recipes often don’t convert well to loaf pans. I’ve never tried it so I really have no idea if it’d work out well here. Sorry I can’t give you a better answer! But if you do try it, you’d definitely have to bake it longer. Made these tonight as a test run for my husbands 30th Bday party, sooo delicious! Will be making these many more times! Awesome! So happy to hear that! Hope your husband has a great birthday. :) Thanks for your comment! The recipe says to line the muffin tins but the pictures show the entire muffin rolled in the cinnamon sugar mixture. Did you take the paper liner off or did you bake the muffins without liners? Take off the muffin liners before rolling in the cinnamon sugar. :) You can also spray the pan if you prefer. These muffins are amazing! This is the second time I made them and both times they have come out perfectly! They are moist and delicious. Thanks for sharing! These are FABULOUS!!! I substituted in Gluten Free Flour and split the maple syrup with some Coconut Sugar. They are super delightful. So fluffy and light! I substituted 2 tbsp of flour with ground hemp hearts, I also made the muffins mini for my picky little eaters. 4 out of 4 loved these. I will definitely make again. That’s an interesting sub! I’ll have to try that. I’m so happy that they came out well! Thanks a bunch for your comment (and sorry for my slow reply!). completely forgot to coat in sugar and cinnamon but these were amazing!! i loved how fluffy they were and i always put double the spices in cos i really like this spice combination and want to really taste it. and in this i did. its like a smack in the face but a good thing! so tasty and such a lovley texture! only thing im disappointed in is i only got 9 and me and mu two kids smashed them all within minutes!! wish i had more to share with others. oh well back in the kitchen to make another batch tomorrow. i guess its a good thing really because if they were not to my liking i didnt waste too many ingredients and i can always double the ingredients. I am going to try these later today! Do you think adding a flax egg may make these muffins a bit lighter…or rise a bit? I think you are right. I like kinda dense cake stuff anyways…just wondered as I usually bake things with some egg sub. I am going to make em as the recipe calls for. looking forward to it. And using fresh roasted pumpkin as that is what I have. Do you think that will work well? Mine came out too moist. Maybe too much pumpkin?? Did you use canned or homemade pumpkin? The water content varies in homemade puree so that could explain it! Butter is not vegan. This is not a vegan recepie, am I right? Looks yummy though. THESE DO NOT RISE IN THE OVEN POUR THE SIZE YOU WANT THE MUFFIN! They are great though! I haven’t tried it but I’m pretty sure it’d work! We just discovered my daughter has a serious egg and dairy allergy, so I’m very thankful for this recipe! If I want to freeze a batch, can I do that with the finished product? Or would you recommend doing it before the butter and cinnamon sugar step? You could freeze them with the cinnamon sugar on them, but it’d get kind of liquidy. I think it’s best to freeze them, defrost them and then cover them in the coating. :) I hope you and your daughter will enjoy them! Do i have to refrigerate these if i make them the day before?? I only sugared the top and it was perfect. Haha. That’s good to hear! I’m so happy you liked them. :) Thanks for your feedback! I made these last night- and they turned out incredible! I substituted Bob’s Red Mill All Purpose Gluten-Free flour for the donut holes, and used a light brushing of Avocado Oil to coat before rolling half the batch in Coconut Sugar/Cinnamon, the other half in Cacao Powder/Coconut Sugar/Nutmeg. They’re addictive, plus a perfect fluffy donut texture. I’m so happy with this recipe, thank you! I’m so happy that they came out well! And how awesome that they work with Bob’s Red Mill’s GF flour. :) That’s great to know. Sorry for my slow reply – Christmas preparation has been a little crazy. ;) Thanks so much for your feedback and happy holidays! Pumpkin doughnuts. These sound so good! There are SO many pumpkin recipes I want to try this fall/winter! Absolutely delicious, I had no pumpkin puree and used half an half carrots and sweet potatoes. As sugar I used maple sugar – we love the taste. thanks for the recipe. Wow! That’s an interesting sub. I’m so happy it worked for you. :) Thanks for the feedback! Pumpkin donut holes are the best! Love the cinnamon sugar coating! In *LOVE* with these. I should probably join you on that detox, but instead lemme just each roughly 5 dozen of these, because how can a normal human be expected to resist?! Oh wow these look so perfect. I love that they are vegan!! I’m going to have to open one of my stashed cans of pumpkin puree to make these! Thanks for the vegan option and just in time for the cooler weather and changing leaves. Haha. Yup. WAY better with cinnamon sugar but then again, isn’t it always? ;) Thanks so much for the feedback! I’m happy you enjoyed them. love the cinnamon sugar coating on these little babies. Sounds so yummy and reminiscent of being a kid and getting donut holes for someone’s birthday celebration! Thanks for sharing! Such a yummy recipe girl! Donut holes are the best!